COUNTRY LIVING AT ITS FINEST FEATURING A VARIETY OF ONE-LEVEL PLANS Sona Homes presents Stone Ridge Estates in Culpeper, VA. Located less than 5 miles from our Redwood Lakes subdivision, Stone Ridge Estates offers all the conveniences Downtown Culpeper but with the privacy of estate-sized acreage lots! As you relax in your new home, or tend to your garden, try not to forget you can reach Charlottesville, Warrenton, and D.C. in a jiff with direct access to Route 29. Stone Ridge Estates is perfect for the custom plan you've always dreamt of, or choose one of your base plans which can be customized to your taste! Build a customized base plan or bring us your custom plan for a quote today! 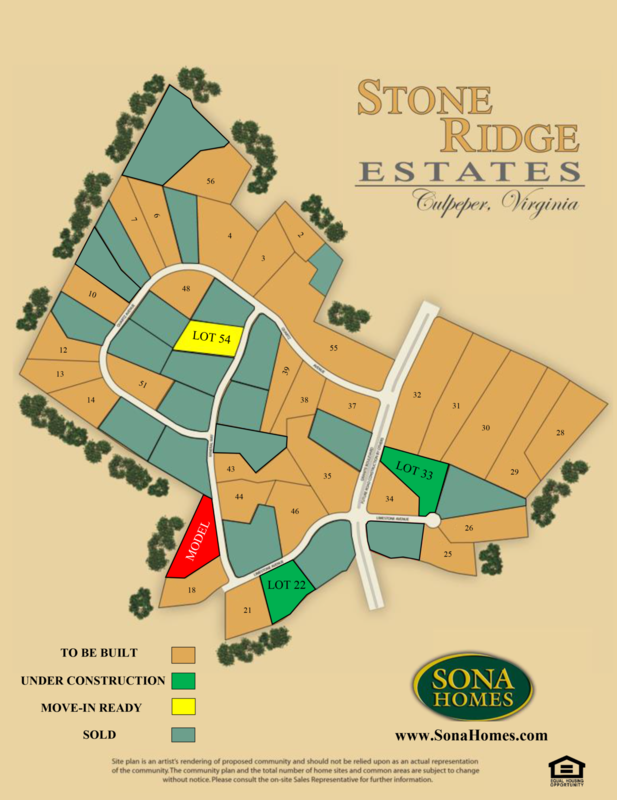 Request information about new homes in Stone Ridge Estates. Call or e-mail today for a tour of the community and Model Home!